the saltwater lagoon of Langebaan – just more than one hour’s drive north of Cape Town! West Coast Life events manages various lodges and niche accommodation in Langebaan. On request, we regularly source more rooms in the Crystal Lagoon Lodge neighbourhood to accommodate groups. All guests check in and have breakfast at our main beachfront house, Crystal Lagoon Lodge – our flagship, a 4-star award winning guesthouse in Calypso Beach. 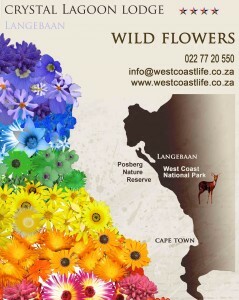 West Coast National Park: birdhides, wildflowers July-October, Posberg Nature Reserve opens 1 Aug-30 Sept for wildflower viewing. Kraalbay is an idyllic little bay in the Park with crystal clear shallow waters. The hill in Langebaan accessible via Melkbosslot road offers a superb view of the lagoon. The ambiance of Crystal Lagoon Lodge celebrates one of the world’s rare sea lagoons. Every morning shells on the shore remind us of the precious marine life that inhabits Langebaan Lagoon. These souvenirs can only be found next to a sea lagoon without any river inlet flowing into the sea. Crystal Lagoon harvests artistic vision and talent in the local community – inspiring creativity via Design Indulgenza >>.